Between 1865 and 1877 the anthracite coal fields of northeastern Pennsylvania were racked by tense, often violent conflict between immigrant miners and the coal companies, which worked in common to cement their absolute control of the collieries. The collapse of the Workingmen's Benevolent Association and hanging of the Molly Maguires. In the late 1870s was followed by a period of relative calm. But in the 1890s, tensions mounted again. Horrid conditions and low wages made the region fertile ground for the United Miners Workers Association (UMWA) organizers who arrived in the region in 1894. In September 1897, some 150 Coal and Iron Police slaughtered nineteen unarmed miners and wounded seventy-three others in the infamous Lattimer Massacre. Strikes followed in 1898 and 1899, after which John Mitchell, the UMWA's young and dynamic president, announced a slate of demands, including abolition of company stores, the ability to check scales, and recognition of the union. When the operators in 1900 refused to negotiate with Mitchell, 100,000 miners walked out for more than a month. In October, the operators agreed to a 10-percent wage increase, but refused to meet with Mitchell. Emboldened by their success, and smoldering at their continued exploitation and a history of injustices, some 150,000 miners went out on strike again in May 1902. Soon, more than 5,000 Coal and Iron Police guarded the idle collieries in four counties, many of them street toughs recruited in Philadelphia and other cities. When companies brought in strike breakers, miners fought back and guerilla warfare again broke out. Accusations flew fast and furious. Companies insisted that strikers were lawless "foreigners" and "anarchists." Mitchell insisted the violence was caused by "Philadelphia criminals," who filled the ranks of the Coal and Iron Police. 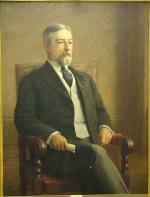 George Frederick Baer, by John Colin Forbes, 1911. 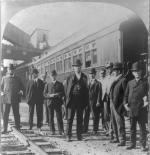 As the strike dragged on, the coal barons refused to yield on any point and Reading president George F. Baer assured the nation, "The rights of the laboring man will be protected and cared for, not by labor agitators, but by Christian men to whom God has given control of the property interests of the country." Outraged at Baer's arrogance, the public began to sympathize with the anthracite miners and John Mitchell's efforts at resolution. Afraid that the mine shutdown would create a national energy crisis, President Theodore Roosevelt invited Mitchell and the operators to a meeting. There, Mitchell suggested that the president appoint a commission, whose recommendations the UMWA would be willing to accept. Out of patience with Baer and the other coal barons, Roosevelt, in an unprecedented move, intervened, set up the Anthracite Strike Commission, and brought the five-month strike to an end. The workers' demands included wage increases and an eight-hour day for some workers, "satisfactory methods for the adjustment of grievances," and more uniform standards for determining pay. Miners, for example, were often paid by the "car" for the coal they mined, but the cars that management sent to be filled were of different sizes. Other miners were paid by the ton - but a ton to the company's paymaster could range from 2,240 pounds to more than 3,000 pounds. These and other unfair practices, such as forced day-to-day leases of company housing, had bred a deep suspicion and distrust among the workers toward mine owners. 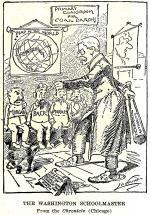 "Roosevelt's Biggest Game," New York Herald, 1902. For three months the Anthracite Strike Commission listened to the testimony of 558 UMW members, nonunion workers, workers' wives and children, mine bosses, railroad executives, and other witnesses. Clarence Darrow closed the workers' case by addressing the mine owners' representatives: "Gentleman, this was an industrial war. ... you on your side were fighting 147,000 men with their wives and children, and the weapons you used were hunger and want to crush out this union which had brought to these downcast, suffering men, women and children the first ray of light and hope and inspiration that had ever come into the darkness of their lives." In the end, the Commission granted some of the workers' demands but avoided many issues that would have made for a fairer workplace. It did not grant collective bargaining rights to the UMWA but did give the union a seat on the conciliation board it created to handle future disputes. The Commission also investigated the actions of the Coal and Iron Police, which had attracted national attention for their brutality and violations of the law. Concluding that on the whole the Coal and Iron Police had acted responsibly, the Commission also found that their presence was an irritant that led to conflicts and that "there were sufficient number of bad characters, taken from the cities, to discredit the efforts of the whole body." It then recommended that Pennsylvania create a "regular constabulary, appointed and paid for by the county or State." Three years later, the state organized the Pennsylvania State Police. The binding recommendations of the Coal Strike Commission were followed by almost two decades of relative calm. Starting in 1920, however, the operators and miners would renew their battles in another wave of prolonged and violent strikes. Perry Blatz, Democratic Miners: Work and Labor Relations in the Anthracite Coal Industry, 1875-1925 (Albany, NY: State University of New York Press), 1994. Thomas Dublin and Walter Licht, The Face of Decline: The Pennsylvania Anthracite Region in the Twentieth Century (Ithaca: Cornell University Press), 2005. Donald L. and Richard E. Sharpless Miller, The Kingdom of Coal: Work Enterprise and Ethnic Communities in the Mine Fields (Philadelphia, PA: University of Pennsylvania Press), 1985.